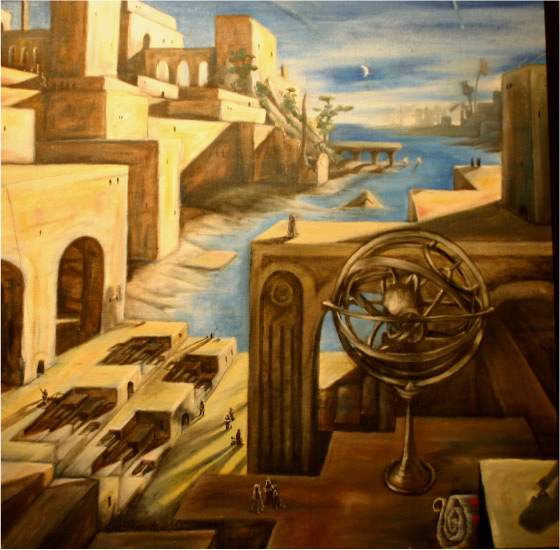 City by the Sea shows tiny figures on a cityscape of surrealistically shifting scale, demonstrating the modern condition of having built upon the ruins of fallen and ancient magnificence. There is an astrolobe, huge to the scale of the figures, and in the sky the moon moves on a rail just like it's tiny model within the astrolobe, completing the play on scale. It corresponds to water.